Guiban Falls is a waterfall located in the heart of Brgy. Guiban, Conception, Misamis Occidental. It is estimated to be 25 meters high. 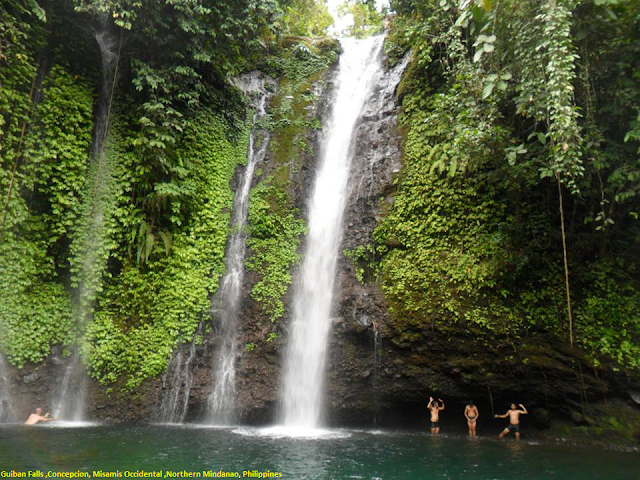 The waterfalls is feed by the abundant green lush of Mount Balabag. The 18th Malindang Ascent offers the mystical beauty of Mount Balabag and Guiban Falls, situated in the municipality of Conception, Misamis Occidental. During visit to this fall you have all the time and opportunity to exploit the flora and fauna of Mount Balabag and Guiban Falls. Donot miss to capture the wild orchids - with your camera bring some extra batteries with you. One of the best features in the area is the hospitality of the Subanen people, one of the most friendly indigenous people you've personally met.